"So here's what's going to happen: Within 24 hours, I'll get a call — the head of Carrier — and he'll say, 'Mr. President, we've decided to stay in the United States. That's what's going to happen. 100 percent." By Lauren Carroll on Tuesday, June 27th, 2017 at 9:53 a.m.
President Donald Trump often points to a deal he helped negotiate with a Carrier manufacturing plant in Indiana as proof that he's stopping companies from moving American jobs to Mexico. However, starting this July, Carrier, which produces cooling and heating equipment, will lay off 632 Indiana employees as it moves its fan coil operations to Mexico. Some of Trump's critics say this cuts against his promise to save the Carrier plant. "Turns out those Carrier jobs are moving to Mexico anyway," tweeted Vox writer Matthew Yglesias June 22. "The vaunted 'Carrier deal' didn't last a year," tweeted Noah Rothman, associate editor at Commentary magazine, also on June 22. But these particular job losses were always going to happen, and Carrier made that fact known at the same time it announced the deal. Trump and Vice President Mike Pence, the former Indiana governor, announced the agreement with Carrier Nov. 29, keeping Carrier's gas furnace plant in Indiana and saving about 800 jobs that the company says otherwise would have been relocated to Mexico. The state of Indiana vowed to give the company $7 million in tax incentives over a decade, and the company agreed to invest $16 million in keeping the company in the state. However, Carrier said at the time that it would still move its fan coil operation to Mexico. "While this announcement is good news for many, we recognize it's not good news for everyone," said a Dec. 1 company memo. "We are moving forward with previously announced plans to relocate the fan coil manufacturing lines, with expected completion by the end of 2017." In May 2017, Carrier specified that relocating the fan coil operations to Mexico would result in 632 job losses in Indiana. That doesn't affect the approximately 800 jobs Trump's deal preserved. "There has been no change in our previously announced plans," said Seth Martin, a Carrier representative. Robert James, president of United Steelworkers Union 1999, which represents the Carrier workers, said Trump's rhetoric might have misled Carrier workers into thinking that more jobs would be preserved. The Trump administration said the deal would save more than 1,000 jobs, yet that count includes about 300 administrative and engineering jobs that Carrier never planned to move out of the country, on top of the 800 jobs the deal actually preserved. "To a degree he has partially kept (his promise)," James said. "You know, it's just that the statement he made when he was here in Indiana was misleading." We previously rated Trump's promise to keep the Carrier plant in Indiana a Promise Kept because Carrier decided to reverse, in part, its plan to move some of its operations to Mexico, preserving about 800 jobs. We knew at the time that a different set of workers would still lose their jobs as Carrier moved fan coil manufacturing lines to Mexico in 2017. Nothing material has changed since we last wrote about this in January, except we know exactly how many workers will be laid off, 632. Our rating remains a Promise Kept. By Allison Graves on Friday, January 20th, 2017 at 12:00 p.m.
Less than two months before taking the presidential oath, Donald Trump proudly touted a package to stop an Indianapolis air conditioning plant from relocating to Mexico as a promise to voters already kept. 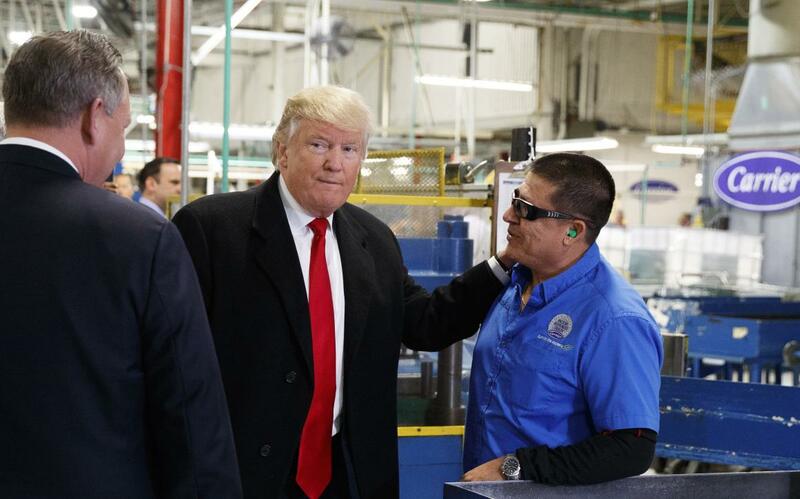 "But I will tell you that United Technologies and Carrier stepped it up, and now they're keeping — actually the number's over 1,100 people, which is so great, which is so great," Trump said at the Carrier plant on Dec. 1. Months earlier in Indianapolis, bosses at a Carrier furnace-manufacturing plant announced massive job cuts with the relocation of the factory to Monterrey, Mexico, by 2017. The factory became the poster child for the reality of modern manufacturing in the United States and a frequent campaign talking point for Trump on the campaign trail. While Trump and Vice President Mike Pence did intervene to keep the factory open, they did not save as many positions as Trump reported, and hundreds of Carrier employees will still lose their jobs. Trump and Pence, the former governor of Indiana, announced an agreement with Carrier Corp. on Nov. 29 that saved 800 jobs slated for Mexico and the Carrier plant from relocation. The state of Indiana vowed to give the company $7 million in tax incentives over a decade, and the company agreed to invest $16 million in keeping the company in the state. To some ears who heard Trump say "we're not going to let Carrier leave" while stumping in Indiana on April 27, Trump clearly stuck to his word. For others, the devil is in the details. The Carrier plant in Indianapolis is actually home to 1,700 employees. That means out of the 1,400 jobs being outsourced to Mexico, around 350 were never leaving. On Dec. 1, Trump had touted those 350 jobs — mainly research and development jobs — with the 800 jobs secured in the deal for his total of "more than 1,100." On the same day Trump celebrated his political victory, Carrier sent a letter to employees, informing them that it would move forward with its earlier plan to relocate its fan coil manufacturing lines out of the country. Those coils were produced at the Indianapolis plant. The company hasn't given specifics on the exact number of jobs that will be affected, leaving 550 jobs in limbo. Chuck Jones, the president of United Steelworkers Union 1999, which represents the Carrier workers, had mixed feelings about the deal. "It's two-fold. First of all, I'm appreciative of what he did," Jones said. "He made a campaign promise and he got involved and, now, 800 people are going to have a job, but on the same token why not be honest about the other 550 jobs. He misled the people." While 800 jobs were saved, experts said the tradeoff of millions of taxpayer-paid incentives is not sustainable policy. "These kinds of policies typically cost a lot of money and rarely work in the long-term," said Adrian Masters, an economics professor at the University at Albany. Lawrence White, a professor at New York University's Stern School of Business, warned some companies might start taking advantage of Trump by threatening to cut jobs in exchange for economic incentives. Also worth noting: Saving 800 jobs from one company will not reverse trends of the manufacturing industry. Carrier's parent company, United Technologies, is moving forward with plans to close a factory in Huntington, Ind., and move its 700 jobs to Mexico. Rexnord Corp., a Milwaukee industrial supplier, announced in October plans to move its part of its plant operations to Mexico in April, along with 300 jobs. Both experts we spoke to agreed that if Trump wants to make a long-term impact on the manufacturing industry he'll have to ensure United States workers are given adequate training. "The only long-term solution is to improve the workforce so that manufacturers want to stay here because the value of skill set the workers have outweighs the wage difference with other countries," Masters said. So with everything said and done, how does Trump's promise stack up? Trump's original promise to save the Carrier plant was mostly fulfilled with the company committing to save most of the jobs slated to move to Mexico. That meets our definition of Promise Kept. The New York Times, "Trump Sealed Carrier Deal With Mix of Threat and Incentive," Dec. 1. The Wall Street Journal, "Carrier Will Receive $7 Million in Tax Breaks to Keep Jobs in Indiana," Dec. 2.